Tell Congress: Strengthen our democracy. Pass voter protection laws! Free and fair elections are the cornerstone of a functional democracy. Yet our last several elections have been marred by anti-democratic measures, voter intimidation, and suppression. This slew of anti-democratic measures across the country has undermined Americans' ability to vote. 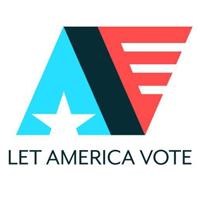 Restoring key provisions of the Voting Rights Act. Paid for/authorized by Jeff Merkley for Oregon; Blumenauer for Congress; Cartwright for Congress; Cleaver for Congress, Donna M. Wilson, Treasurer; Himes for Congress; Citizens to Elect Rick Larsen; Re-Elect McGovern Committee, Harley Rouda for Congress; Rashida Tlaib for Congress; Big Sky Values PAC; CHC BOLD PAC; Let America Vote; National Democratic Redistricting PAC; People For the American Way; and Washington State Democrats.